The Chief Justice of Pakistan (CJP) Mian Saqib Nisar on Friday observed that the court was not limiting its review of the Elections Act 2017 to Nawaz Sharif alone, and had to look at the bigger picture to ascertain its implications. The remark was made while a three-member Supreme Court (SC) bench headed by Justice Nisar heard arguments from multiple petitioners, including Advocate Zulfiqar Bhutta, the Justice and Democratic Party (JDP) and lawmaker Jamshed Dasti among others. 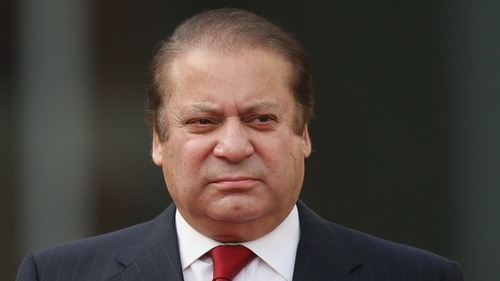 The counsel for JDP, Sheikh Ahsanuddin, claimed that the amended Elections Act was only passed to pave the way for Nawaz to retake his position as PML-N chief, even though the Constitution does not allow a disqualified person to head a political party. Advocate Bhutta also adopted the arguments presented by MNA Sheikh Rashid's lawyer, Barrister Farogh Naseem, and PPP's counsel, Latif Khosa, in previous hearings. He added that there was no way a person disqualified by the apex court could become a political party chief. To this, the CJP reminded him that the new law passed by Parliament could allow any convicted person to assume the position of political party head. On Feb 6, Naseem had similarly argued that the Elections Act 2017 was passed only 17 days after Nawaz's disqualification, which indicated its mala fide intent. When the CJP asked how the appointment of a disqualified person as party chief contradicts the Constitution, he had said that according to Article 63-A of the Constitution, important powers were vested in the office of party chief, including the disqualification of a legislator belonging to their party. "The party chief can [thus] also influence legislation and the election of a prime minister [by exercising that power]," Naseem had argued. Khosa, in his arguments on Feb 7, had raised similar questions over the timing of the passage of the Elections Act 2017, terming it "suspicious". He said that the Act negated Article 62 (1)(f) of the Constitution and the court had the authority to protect it. In today's hearing, Justice Nisar said that the apex court can only nullify a law if it contradicts the Constitution. He also pointed out that a representative of the Election Commission of Pakistan was in the Standing Committee when the Elections Act 2017 was being drafted. Dasti's lawyer, Azhar Siddiq, argued that any legislation passed by the National Assembly cannot undo Article 62 (1)(f) of the Constitution. He further stressed that a political party chief "can influence millions of voters." The hearing has been adjourned to February 13. I totally agree, disqualication law should apply to all according to country's consitution. No matter, who they are and what is their political and social status. Let's sort this out once for all, and no dishonest, criminally or otherwise convicted and untrustworthy person should be allowed to hold any position in government and parliaments. This will set a good example for present and future politicians - honesty, loyalty, good character and willingness to work hard for people should be the main requirements for future candidates. Holding important positions should only be the prerogative of people with clean records and not those who have been convicted in a court of law. @Anti-Corruption_Pakistani Bravo Saeen :) You spoke my mind 100% golden words. Its Pakistan bad faith. People sitting in parliment are protrctor of their own interest, looters corrupter and murderer. SC doesn't understand the dynamics of a political party. Just how hard would it be for Nawaz Sharif to appoint a dummy party chief, just like the dummy PM, and run the party from the backstage? @PrakashG But for how long.. Nawaz has huge EGO and he would do something foolish to prevent party take over thats why he didnt appoint his brother. It would be good to bar him from any political activity he will become non-functional individual very soon. @Anti-Corruption_Pakistani There should not be 2nd thought about this. Legislators cannot make or pass any bill that is beyond natural justice, or universal justice,for example no law can be passed which says a theft is a good action. A million dollars question yet remained unanswered,as to how a 'convicted ' 'disqualified ' person by no less than an Apex Court can hold or can lead as Chairman of certain party , and how can ECP can maintain that party registration whose Chairman is already condemned. CJP will inshallah see this matter on larger canvas,and keeping in mind the future course and affect of such legislation, which will adversely affect our nation's integrity, and will be nothing but a joke . With all due respect, the judiciary and legal experts only are the ones using the lingo correctly, i.e. usage of conviction and disqualification in appropriate settings. Some people are also reporting him as convicted of money laundering, which is sub judice and is not a conviction as of yet. You appear to be overcome by emotions but otherwise an educated individual. Hence I am mentioning that it is tantamount to sinning as well as libel what you have written!